My 5 year old daughter, B, was up and fully dressed in her school uniform at 4.30AM on Tuesday morning! The reason for her excitement? It was December 1st and she just couldn't wait to open the first door on her advent calendar. This year, we asked if she wanted a Lego Friends calendar, but refreshingly (for my bank balance), she said no. She had her eye on a Frozen calendar that had chocolate behind each door and nothing else compared. Big brother, 8 year old E, has a Lego Star Wars calendar, middle brother, 3 year old W, has a chocolate Star Wars calendar and I bought hubby a Meaningful Chocolate Company advent calendar. But none of these, for me, reflect the true meaning of advent: preparing ourselves to celebrate the birth of Jesus. As a Roman Catholic, I do this by going to confession and saying sorry. But even if you don't believe in God, surely there's some room to use Advent as a time to reflect on how we can make peace and cleanse our soul ready for the new year. To make time in the day for all the family to take a quiet moment, this year I bought an advent candle. 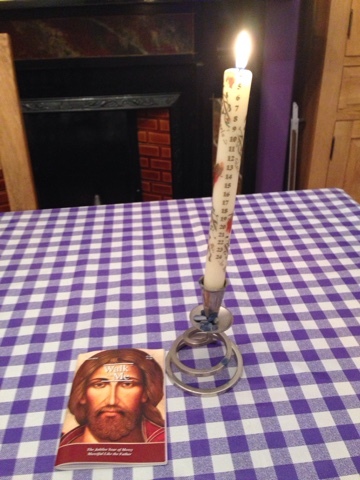 We light the candle every day before dinner and we pray. I use a Walk With Me booklet I was given at church to help guide our thought and E and B contribute their own prayers. I can honestly say I've been pleasantly surprised at how they are just as excited about lighting the advent candle as they are about opening a new door on their calendars. I had been feeling a bit guilty that we don't fo Elf on a shelf. But I think I prefer our candle as our latest advent tradition.